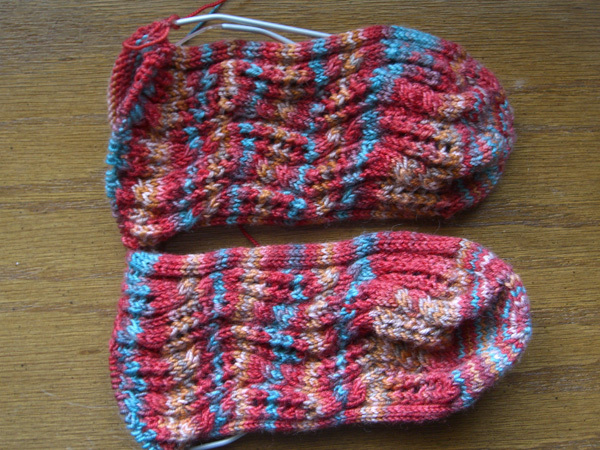 I’ve been knitting away on the Tipsy Knitter socks. I’m up to the gusset increases — actually, I’m almost done with them since I’m further along than this picture shows. Now I face that eternal question… Eye Of Partridge or heel stitch or something else on the flap. hmmmm… Maybe cabled flaps? That might be fun. I’ll have to ponder. I do like the way the colors are pooling and how it works with the pattern. Usually I’m not happy with pools, but I think it looks cool. We’ll see if I still think that when I’m done! I knit away some on the green sweater this weekend. I’m about 15 rows shy of the arm pits. I worked on it for a little while on Saturday while watching the Kentucky Derby. Since I had a mint julep in hand (I make mine from scratch) , not a lot of productive knitting was accomplished. The rest of the weekend was taken up with busy but rather mundane tasks. Stuff to do. Bills to pay. Weeds to pull. The usual. #1 Son is still off gallivanting around Alaska. He called me today from Fairbanks, where, he reports, it never really gets dark. He thinks it’s kinda cool. They are heading back to Canada and expect to be in Whitehorse tomorrow. It will probably be a replay of their outbound trip, except backwards of course. He should be back in about a week.